This unique reference was written with the intention that users can learn Inventor on their own with little or no outside help. Unlike other books of its kind, it begins at a very basic level and ends at a fairly advanced level. The following is new for 2009…How to create a broken view using the Break command; How to complete a multi-plane Loft; How to use the Design Accelerator. 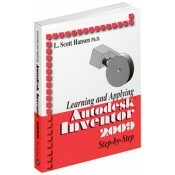 It's the perfect resource for anyone enrolled in Engineering and Technology programs, as well as professionals interested in learning Autodesk Inventor. It applies to Inventor releases 2003 – 2009. • Includes a new chapter covering the basics of the Design Accelerator.